This basket measures approximately 12" in diameter. It is woven entirely of pine needles, all by hand. 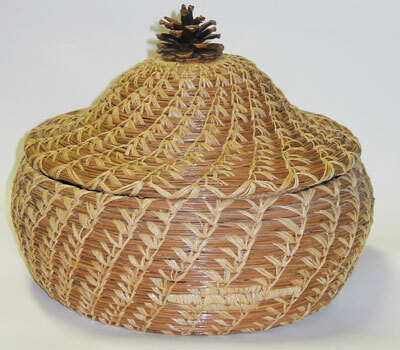 It includes a top lid that has a pine cone attached to the top. The artist is located in Bouse, Arizona, and has put a lot of work into the piece. The detail is amazing, and there will never be another one quite like it. The inside of the basket is marked by the artist.